Once again, a very funny strip. I love the news headline – that was the funniest part!! I don’t know if this strip was funny. Hey Pope Palpatine: It’s just a “frackin’ cracker”. Awesome. Eat more crackers indeed! Crackers will make it all go away. Is the link between believers and non believers the belief that they are incapable of knowing anything? Very good! A little je ne sais quoi indeed! The only other French that I don’t know can’t be posted here. Hey author, would it kill ya’ to click and drag an eyebrow or pupil once in a while? 😉 You know, give the boys’ countenances some JOIE DE VIVRE! The strip is genius as always… just want to see the anointed [er, unctuous] ones taken to the next level (an Earthly one, of course). Thanks! Well, hey , OK. At last the pope apologised. Thats a start. Now the church can go back to being infallible. Googled “eat more crackers” and this comic was 5th … already! Ireland, Germany and now a school for the deaf in the US – and with a paper trail that leads to pope rat. Did anyone notice that Moses was unaffected by The Great Art Change Of Ought Nine? I hadn’t, but maybe it’s because he appears less often so to change him would make him less recognizable? maybe he’ll be in a series of strips and change. @kiyaroru, nina – Moses has changed a little bit. He was a later addition to the strip, and more care was taken over him. 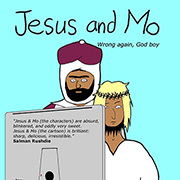 The art change was partly about making Jesus’ Mo’s noses better than Moses’. 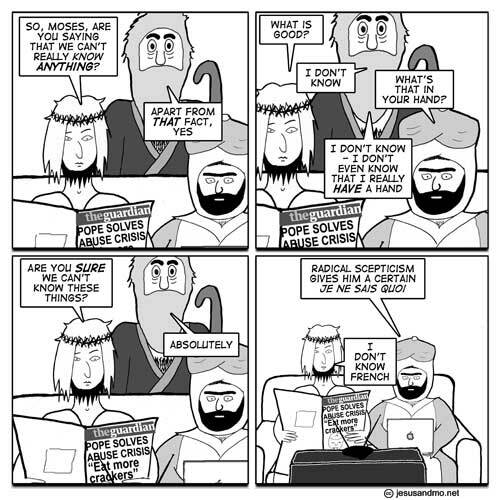 Militant Agnostic: I don’t know, and neither do you! For anyone else who came aboard late and are working their way through them, How friction’ awesome is this comic?!? I’ll be caught up in a few days. Twill be a sad day, indeed.